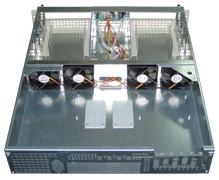 - 4x 5.25" bay to install 4x CDD, 4x HDD mobile rack, backplane etc. TeleServ® - front panel controller - includes a WatchDog to supervise the computer and has 4 buttons and 16x2 LCD to allow for a dialog with the user. You can set IP address, netmask, gateway address, shutdown the computer, readout statistics, basically anything you want because most of the logic is implemented with a perl script and it can be changed easily. The controller is connected to your computer via RS232 serial line. Follow the polarity while attaching to PowerOn and Reset pins! - 4x 80x80x25 2800RPM fans, 3.72m3 total controlled by TeleServ®. The use of controller increases reliability of hardware work due to total monitoring of cooling system and signalling in case of failure. The use of controller combined with the system of redundant cooling allows to create fault-tolerant system with long-life performance. 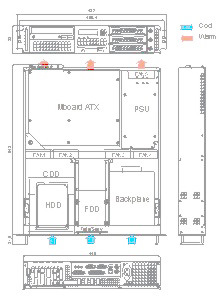 ATX motherboards have standardized mounting holes to fit different types of chassis. 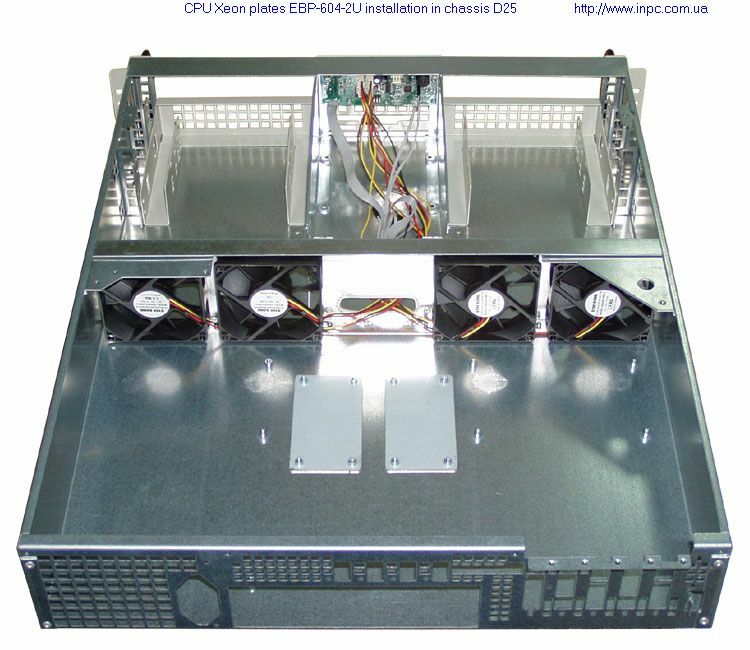 As to CPU heatsink mounting holes - they are not standardized. Determine and spot CPU heatsink mounting holes and then fix the EBP-604-2U plates by selfadhessive tape, glue or by tiny revets. Make shure that standoffs of the plates fit perfectly to the position of CPU heatsink mounting holes at the motherboard, otherwise the CPU heatsink screws would not align to the thread. Since, the plates must be installed prior to installing the motherboard into the D25 chassis, all operations expect pre-scheming and accuracy of the stuff. 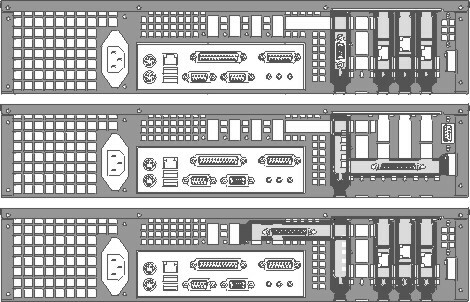 The EBP-604-2U plate is supplied as option. It is advisable to order the plate together with chassis. Slide the D25 based system along the pre-installed Holders in the suitable rack. Tighten the rest 2 screws on the opposite side of the front panel where it attaches to the rack.